The first thing that caught my attention was not the two models atop of the bus, but the extended destination box that houses florescent light tubing. Bus #2615 is a '58 TDH-5106. Rare to see a Route 1 Fifth Avenue roll sign on a 5106. Rt. 1 was a once-a-day tripper using a 4506 by the late '50's. Funny thing Frankie. That's the first thing I noticed too! I remember seeing those 5106's during their golden years in the late '60's, working the B46 down Utica Ave. in Flatbush. I always wondered why they had that bulging sign housing. Why a 5106 would be used for this display is obvious. 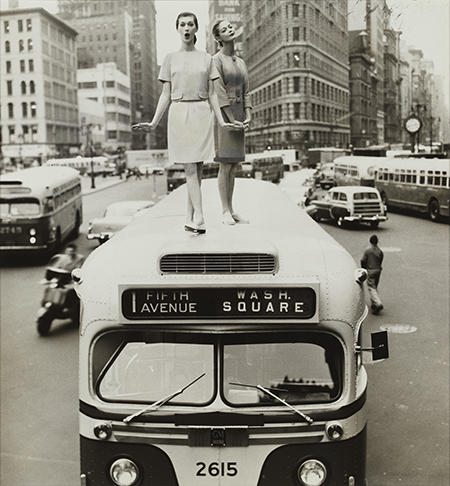 It wouldn't have looked as good if the gals danced on top of a 4506, now, would it? Imagine trying to dance atop a C40LF or Orion VII HEV!